Don't miss this essay by the Headmistress at Frugal Hacks. Popcorn and soda parties? Her mother's story gave me chills. "...to do less and do better in the coming weeks." I don't know which impresses me more, the resolve I see at Where the Lilies Bloom or the wonderfully simple way she created an heirloom nursery out of scraps. Pleasant View Schoolhouse makes a funeral luncheon brighter with care and creativity. 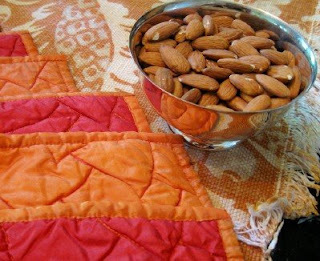 Above: thrift store games for Friday night; placemats from the church yard sale & bulk almonds for snacking. Ah, thrift store games- we used games we picked up to decorate the walls in our game room. 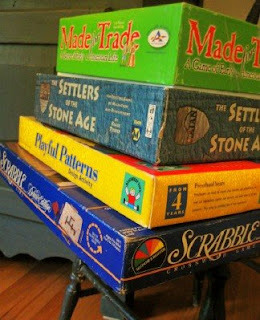 Ad, of that stack, we played Settlers of Catan TWICE this week! Joanna, I saw that photo! Using the gameboards on the wall is a great decorating idea. I believe a recent Southern Living or design magazine did the same thing? About Settlers of Catan: it seems too advanced for the 6-yr-old, at least this version, but I couldn't leave it there for FIFTY CENTS, could I? He ended up making his own simplified rules for the game. Does anyone know at what age Settlers is fun for a bright kid? Wow, three great links for fresh inspiration and encouragement. Thanks, Meredith! Meredith, your bargains always amaze. AND, you are answering your own question. Settlers is fun for bright Andrew right NOW, at this age. Making up his own rules just so he can play it ... now that's fun! Maybe invite a young couple over to play with you and hubs so he can hang on the fringes and see how it is done with actual rules, but no pressure on him. (Wouldn't be surprised if he joins in occasionally). Thanks so much for those inspiring links. You always find such interesting blogs to share! Great links Meredith - you introduce me to new friends and remind me to visit old dears all the time! Thank you! Again! You always unearth the best treasures, Meredith, whether it's at a yard sale, thrift store, your own closet, the grocery store, or the Internet. Thank you for these links. I left a comment at the Frugal Hack link because it drove home some healthy humbling that happened this weekend due to a post of mine. Your site is inspiring. Keep up the good work!